Just a little round-up today of pieces from around Europe…I admit I can’t read half of them! 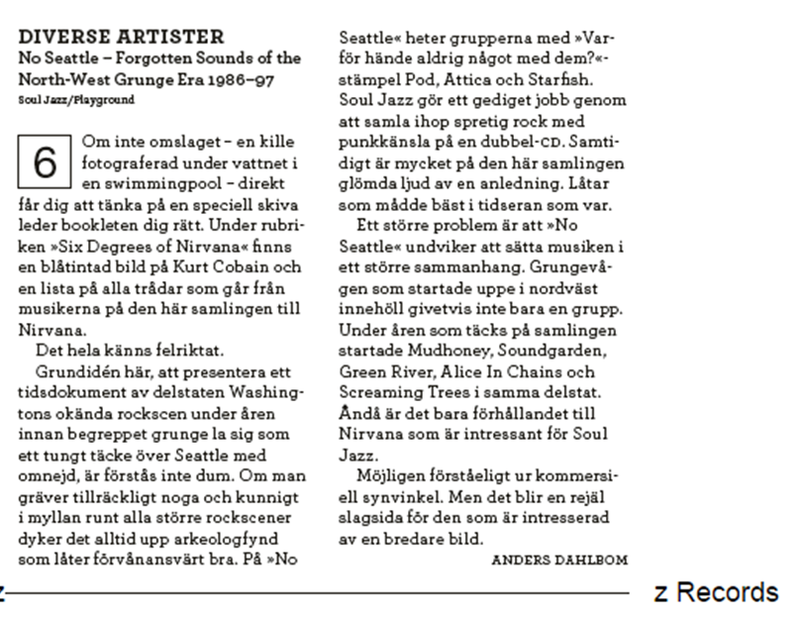 This first one is from Sweden – a fair and moderate review but points deducted because in his view the release isn’t ‘grunge enough’, he’s dubious about it not containing, essentially, “the greatest hits of Sub Pop”. It’s a bit of a defining challenge really – what made me interested in doing the release in the first place was to try and show that there was more to the State of Washington / State of Oregon than this single stereotype…But seeing the word grunge in the title makes some people confused why that’s not the be-all-and-end-all of what they get across the two discs. The reduction of entire musical cultures to single shorthand ways of speaking about them – it’s exactly why I thought a release was needed. In a relatively centralised nation like the U.K., it’s very hard for subcultures to escape notice of the media or to be ignored by the British music industry – even if most of those bands never penetrate the U.S. market. The same is true of other Europe states – massively smaller than the U.S. geographically, massively centralised media and massively centralised music industry infrastructure. The result is that the music media are unused to scenarios in which music escapes their attention. Faced with a release on which they’ve never encountered any of the bands, where they ‘might’ (if they’ve delved deeper) have come across Bundle of Hiss as a footnote to Tad or Mudhoney, it seems to give them uncertainty. They equate the attention given to the grunge bands as an indication that those bands were the best the North West had to offer rather than of an industry machinery momentarily fixating on a particular sound and milking one version of a regional identity while neglecting the greater sum of the diverse music present there. Sheesh, I feel awful second-guessing someone’s review – they’re entitled to say whatever they wish – but…I think the hole in awareness is a fair point. On the other hand, it does say that the songs themselves are likeable, so that’s good. This is a nice one ‘auf Deutsch’ from a Swiss publication called Loop – the guy has definitely delved in and his piece brings out the various debates that are fair to have around the release; to what extent was the ‘Seattle sound’ just ‘the Sub Pop sound’? To what extent is the industry different between U.S. and elsewhere? Were Nirvana unique in many respects and deserving of their meteoric success? Then he focuses on the songs themselves and just comments on what he’s hearing. 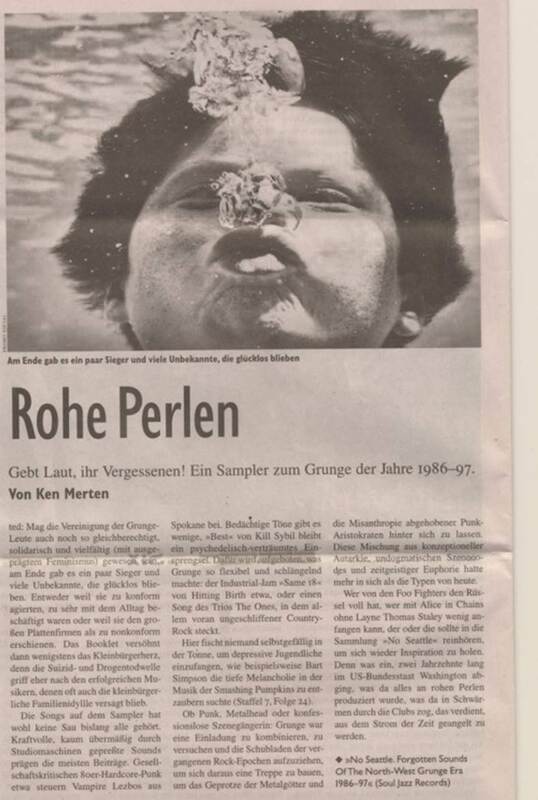 Again, a very mellow cool review from a German publication – same approach, picking out labels, the variety of sounds, the connections between individuals and bands – citing the release as being a bit of a documentary / sampler of the scene. From France, here’s two pieces, one from Les Inrocks – a pretty major magazine there – and Rock n Folk. I’ve met a guy who worked for both publications actually…Nice to see familiar names. This final piece is a little hard to read without zooming (sorry!) and comes from Tageszeitung Junge Welt – a German left wing newspaper who gave it a full half page and picture, how nice of them! The title basically translates as “Raw Pearls” and the sub-title is something like “Listen to the Forgotten”. It goes on to say stuff about the mash-up of genres that took place in the North West, the diversity of music on the discs, the reconciling of this small number of global superstars versus the many who just kept on playing to this day…A nice read.